The Sierra Club Youth Corps is a summer program offered by Don’t Spray Me! beginning in 2017. 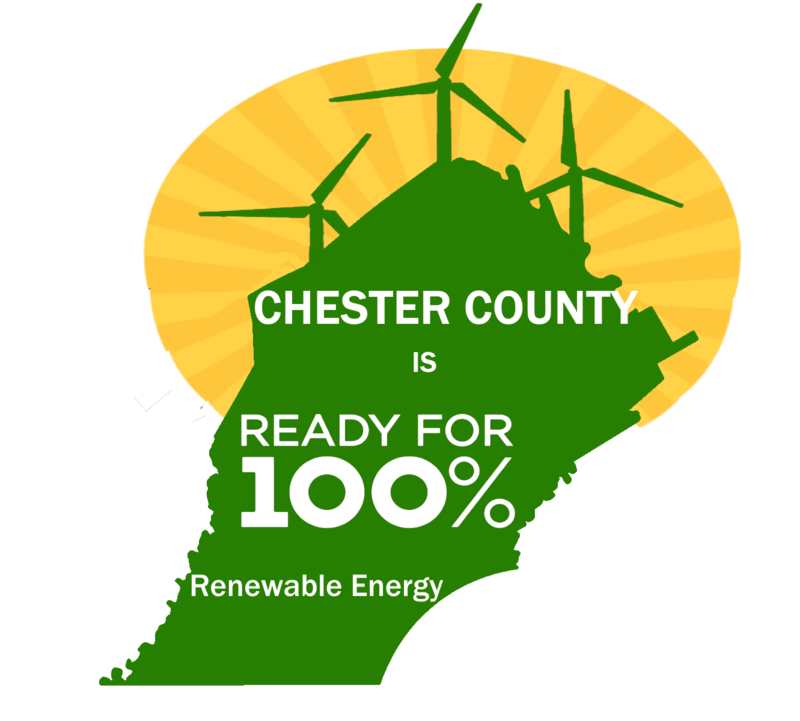 As part of the Sustainability Committee of Sierra Club’s Southeastern PA Group, Don’t Spray Me! 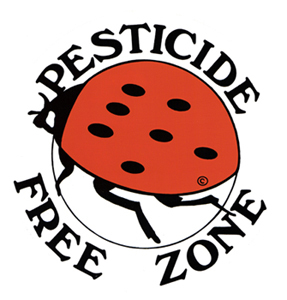 works toward Sierra Club’s goal of cutting back human practices harmful to nature and human health. 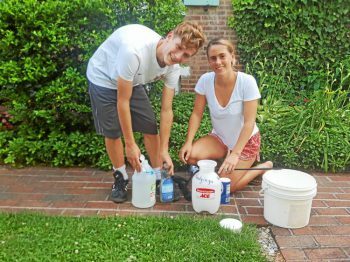 In SCYC’s 2017 project, organized by Margaret and Jim Hudgings, a group of high school students (photo below by Bill Rettew, Daily Local News, 7/17/17) experimented on neighborhood sidewalks to show that a non-toxic solution is effective in fighting weeds in brick sidewalks. How to do it: Pour a small amount of vinegar into your, then pour the salt into the jug of vinegar and shake it vigorously. Pour the salted vinegar into the sprayer and add the liquid dish soap. Swirl the sprayer to mix in the soap, but not so much as to generate suds. Spray it on the target weeds, ideally in the morning of a very sunny day. When finished, spray plain water for a few seconds to clean the wand. 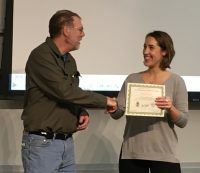 SCYC’s 2018 project, Adopt A Drain, was organized by geologist Rachel Davis. 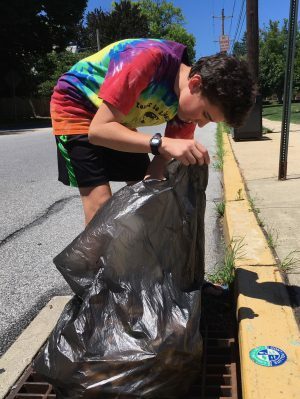 Thanks to a generous Sierra Club Grassroots Network grant, we were able to hire West Chester University graduate student Kyle Erisman to be part of the field surveys and particularly to produce GIS mapping of storm drains in the Borough. 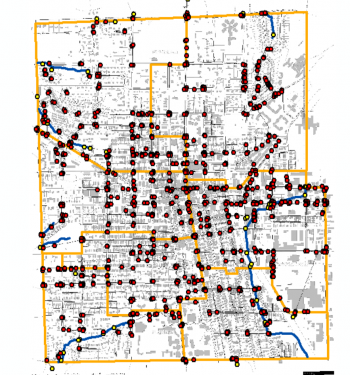 Participants, under careful guidelines, walked selected streets to locate storm drains, clear above-ground blockage (including environmentally damaging plastic bags), peered through the street grills, and reported to the Borough Department of Public Works whether drains needed attention as being clogged below ground or containing potentially mosquito-breeding stagnant water (below: map by Kyle Erisman showing drains, streams, and other features). In 2019, we plan to continue this project by organizing citizens to patrol storm drains in their neighborhoods and report drainage problems to the Borough, while reorienting the Sierra Club Youth Corps to another innovative and educational project.